MIOS Sources are now stored on an SVN server which uses SSH for secure transfers if you need write access. This has many advantages for us, but we may first need to setup a couple of tools. Web (read-only): This allows you to view individual files via web browser. If you're reading this, then you already have a browser installed. All you need to do, is click here. This method will not save the files to your PC's hard disc unless you do it from your browser, and will not allow you to upload new/edited code to the server. It's just an easy way to look at the existing code. 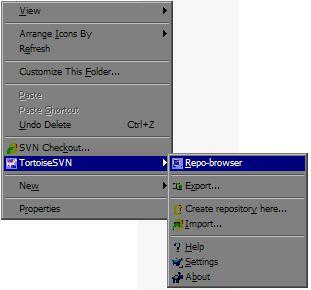 SVN Client (read-only): This allows you to view the desired parts of the repository in an SVN repository browser, or 'checkout' the parts of the repository you need and save them to your hard disc. This method will not allow you to upload new/edited code to the server. SVN Client with SSH2 (read/write): This allows you to view the desired parts of the repository in an SVN repository browser, or 'checkout' the parts of the repository you need and save them to your hard disc, etc. This method will also allow you to upload new/edited code to the server. If you use this method, you can also install an additional tool to assist with the login process (it will prevent you from having to type in your password lots of times). If you only need web access, you can stop reading now, and click the link to http://svnmios.midibox.org. Easy! PuTTY PuTTY is a TTY/SSH client for Windows and *nix. This toolkit allows us to use SSH encryption, which is required for write access to the repository. If you want to use the TortoiseSVN client for read-only access, you don't need this software, so click here to skip this section. Installation is very simple, just run the .exe, and click 'Install','Next', 'Next', 'Finish'. This step is only required if you need to write to the MIOS/Application code. If you don't change any code, then you can click here to skip this section. If you want write access, it makes sense to do this step first. MIOS SVN access uses SSH-2 for security. SSH uses a pair of keys (a 'keypair'); one private, and one public. 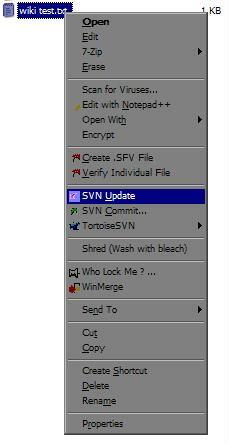 Your private key stays with you, and your public key is sent to the SVN server. This allows the SVN server to ensure that you are really who you say you are. One of the applications in the PuTTY package is PuTTYGen. This tool gives us a simple method of creating the keypair. Run the program - you should see the icon in your Start Menu after using the above installer. Now, click 'Save Private Key'. This will create a file with a .ppk extension. Save it someplace handy, you'll need this later. Next, click 'Save Public Key'. This will create a file with whatever extension you specify, you could name it as *.pub. Save it with your private key. There is a section of the forum with restricted access for programmers who may need to upload. If you need this access, PM TK, he may add you into this group. Once there, you will find a sticky thread where you can attach your public key (NOT the private one. That's private, man! ;) ) to a post. Once your public key has been added to the MIOS SVN server by an admin, then you will be able to authenticate to write to the repository. Let's move onto the next step. Run PuTTY. There should be an icon in your start menu. Now drill to 'Session' in the tree-view. This should be the same screen you saw when you first ran PuTTY. 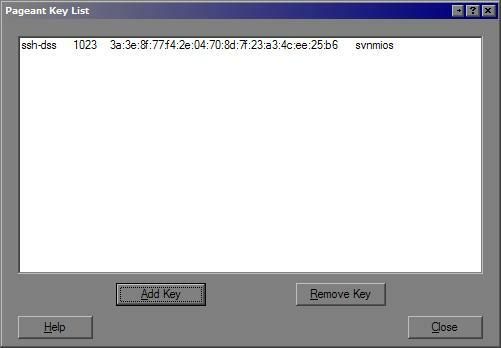 In the text box at the top labelled 'Host Name (or IP address)', type “svnmios.midibox.org” (without the quotes). The Port stays at 22 - Note: You might have to allow this port in your firewall! 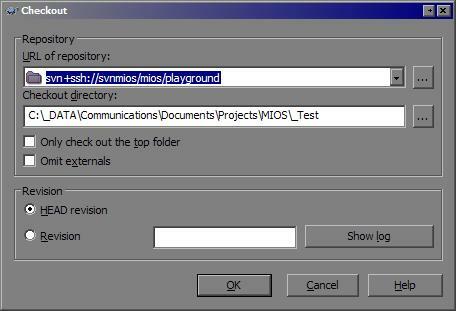 In the text box labelled 'Save sessions', type in a session name such as “svnmios”, and Click 'Save'. You should see your session name added to the list. Remember this name for later. This step is not required, but is a good way to check that your session is setup correctly and that your SSH keypair is functioning correctly. After you save the session above, just click the button at the bottom labelled 'Open'. Click Yes if the SSH fingerprint in your message matches the one in this picture (means that it's really midibox.org you're talking to) and you should not see this message again. Next you will be prompted for your private key's passphrase. Type it in, and you will see the following screen. Note the error, “Server refused to allocate PTY” is a cosmetic error, and is totally normal. Other errors probably mean you did something wrong ;) Close the screen when you've confirmed that all is working OK. Note that if you are prompted for a password, then your SSH keypair has failed. If you're sure that TK has added your public key, then your session config may need checking. This step is not required, but it can make life a bit easier if you are using SSH authentication for write access.Click here to skip this section. 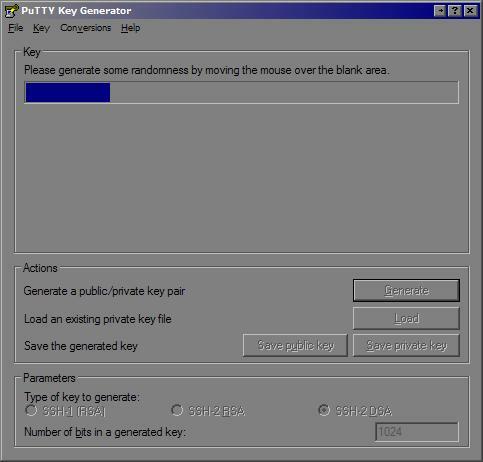 If you tried the PuTTY session test above, you will have noticed that you are prompted for your private key's passphrase. This happens several times during the normal login process, and personally I am way too lazy for that ;) If you're lazy too (or maybe have arthritis/tendonitis/RSI/etc like me), you can use one of the PuTTY tools, called Pageant, to store the private key and it's passphrase. Double click the icon, and you will see a mostly empty window. Click the button labelled 'Add Key', and browse to your private key (*.ppk). When you click 'Open', you will be prompted for your passphrase. Right-click the Pageant icon in the System Tray. A context menu will pop up, and you will see a menu item 'Saved Sessions', and below that, you will see your previously saved session. Click it, and a terminal session will open up and log you in, just as in the above PuTTY Session test, but without any intervention. Smooth. If you would like pageant to take care of the logins for you all the time, you should set it up to automatically load your key every time you boot. First, find the shortcut in your start menu. Copy this shortcut into the 'startup' folder, so that it will run every time you start your PC. Now, right-click on the shortcut, and select 'Properties'. In the box labelled 'Target', you will see this: “C:\Program Files\PuTTY\pageant.exe”. Add to the end of this field, the path to your ppk file, enclosed in quotes; so the 'Target' field will now read like: “C:\Program Files\PuTTY\pageant.exe” “C:\somedir\svnmios.ppk”. Click 'OK' and you're done! TortoiseSVN TortoiseSVN is a Windows Explorer (aka 'My Computer') shell extension. This allows you to integrate the MIOS SVN repository with your local PC file system, and to use a dedicated SVN repository browser. This tool is required for all methods except web-based access. You can download the installer from the download page. There are 64-bit installers, release candidates and nightly builds available from that page, but if you don't need those (or aren't sure) I would recommend that you download the current stable version |TortoiseSVN-1.4.8 by clicking this link. Using Tortoise is a subject which I will not cover in-depth here, as the Tortoise manual and Website do a good job of that. The thing to remember, is that this is not a standalone application, so much as it is an Explorer extension; so everything is done by right-clicking on files and folders. Create a new folder in Windows Explorer, to save the code you will download, and change directory into it. 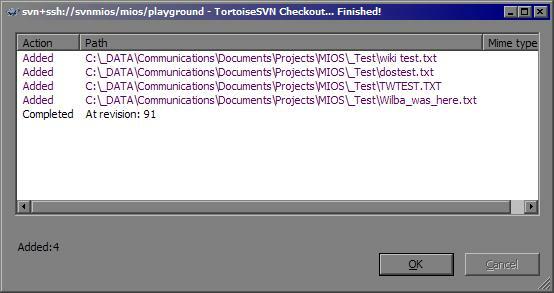 Right click in the folder, and you will see two new items in the context menu, TortoiseSVN (which is a submenu)', and 'SVN Checkout…'. Below the TortoiseSVN submenu you will see the Repo-Browser, which could be a good tool to test, but instead, we'll go ahead and do a Checkout. Once you select the 'SVN Checkout' menu, you will be presented with a dialog box titled 'Checkout'. In this window, you can enter the URL to the repository. In our case, there are two ways to do so. You can now open “C:\… your path here …\mios\playground\wiki test.txt” and add some text. Close and save the file. 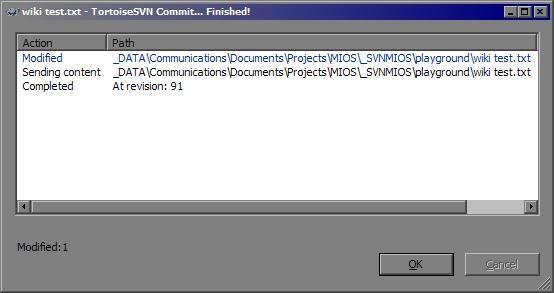 Right-click the file in Windows Explorer, and in the context menu, select 'SVN Commit…'. ……. and now your changes are online for all to see!! Perl is required to run 'make dist'. If you are going to be making your own apps, or distribution packages for your own mods, you'll need this. If you are prompted to restart your computer, then do so (yes, now… I know it's annoying!). Minimise any open windows so that you can see the desktop. Right-click on 'My Computer', select 'Properties'. You need to add the directory you've created above, when you want to build from SVN sources. This includes running 'make dist' to create a distribution package. Click on the 'Advanced' tab, then click 'Environment Variables'. Under System Variables, click 'New'.